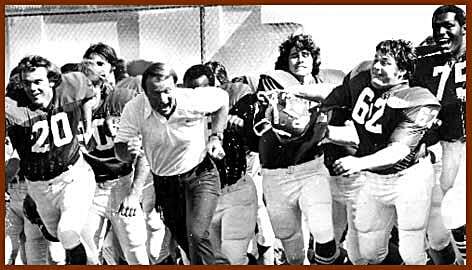 The '74 Sooners were the definition of hard-nosed, on both sides of the ball. The defense gave up an average of fewer than nine points a game, and the offense, which led the nation in scoring, averaged a staggering 73.9 rushing attempts a game, simply mauling opponents in the process. Featuring eight All-Americans, OU began the season no. 1 in the AP poll, dipped to third after a lackluster opening game against Baylor, but finished undefeated to give Barry Switzer his first of three chips as the Sooners head coach.